Two Door Wardrobe. Features Two Drawers And A Hanging Rod. Available In Beech, Cappuccino, Light Cherry, Cherry, Red Mahogany and Black Finishes. 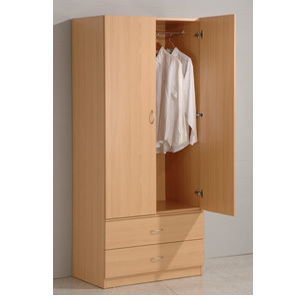 This Wardrobe Is The Perfect Choice For Your Bedroom. Strong Construction. Easy To Assemble.